During the summer of 1995, rural Henderson County, Texas and the area surrounding the county seat of Athens is burning as the result of pasture and forest fires during a severe drought. In the midst of those blazes, the body of a man is found bound, gagged and burned in the bed of his pickup truck in a field near a 500-gallon gasoline storage tank. The discovery leads to a murder investigation by authorities and a reporter for the local newspaper into the convoluted events surrounding a murder-for-money scheme gone badly awry. 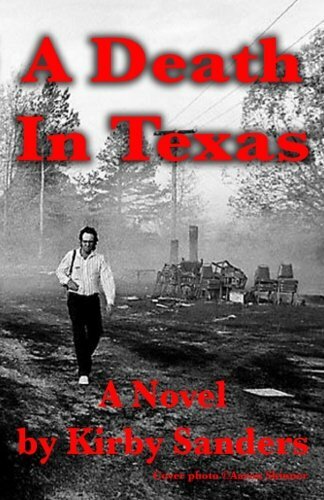 Based on actual events, A Death in Texas is a fictionalized account of the murder case. It is rich in detail about the small town and surrounding county and the sometimes quirky inhabitants thereof. ABOUT THE AUTHOR Kirby Sanders is a career journalist, writer and historical researcher originally from Houston, Texas, and presently living in Northwest Arkansas. His writing endeavors have included poetry, short fiction, journalism and historical research reports. During the late 1960s through the 1980s, he was active in the Southern Seed Poets Guild and Poets’ Workshop literary groups in Houston. During that time he published several collections of poetry and edited several small literary journals. He also assisted in literary projects with Wings Press of Houston. Among his early writing credits was publication in From Hide and Horn, A Sesquicentennial Anthology of Texas Poets published by Eakin Press of Austin, Texas, in 1986 wherein 150 Texas writers were selected to write a work encapsulating one year in Texas history. In the early 1970s, he was employed as a writer and reporter with the Houston (TX) Chronicle. During the 1980s, he branched out into travel and tourism writing. During the 1990s he returned to daily journalism and worked at newspapers in East Texas and Northwest Arkansas. During that time, he received several awards for investigative reporting. Amongst those was a substantial series on the arrest of the final suspect in the 1963 Sixteenth Street Baptist Church bombing in Birmingham, Alabama -- the infamous “Four Little Girls” murder case. Many of his feature stories during that time focused on the history of the communities in which he worked. He has also worked in film, radio and television. In 2011, he was selected as a consultant to the National Park Service to prepare a substantial report and mapping survey on the 1858-1861 Butterfield Overland Mail stagecoach route in the states of Missouri, Arkansas, Oklahoma, Texas, New Mexico, Arizona and California. A Death In Texas is his second novel. His first was Nusquam Res, Nusquam Esse; the Final Journey of Ambrose Bierce.